To whom do we belong? To whom do we owe allegiance? Who is the source of our salvation and the unity of the community? Is it not the Good Shepherd, who demonstrates his great love for us through his willingness to lay down his life for his brothers and sisters? Is it not the one whom the powers and principalities of this world chose to put to death, but whom God has vindicated through resurrection and by creating a new community in his image? These seem to be the messages emerging from the texts for this Fourth Sunday of Easter. The connection between the cross and resurrection, and our own realities continues to ring strong, inviting us to find meaning and purpose, love and truth, salvation and hope, in the person of the Good Shepherd. These are in many ways familiar texts, especially when you add into the mix Psalm 23. They offer words of comfort and hope, but also challenges to our ways of doing things. And for more progressive and inclusive Christians amongst us, there may appear to be an overriding exclusiveness in the message, a perspective most clearly present in Acts 4, but is also present in the two Johannine texts. How do we understand this call to follow the Good Shepherd with an open and welcoming heart? Let us begin with the reading from 1 John 3, a passage that speaks of Jesus’ love, which is expressed in his willingness to lay down his life for us. His sacrifice provides a model for living a life of love that is marked by action and truth, not merely one of words or speech. How do we show this love? One way, John writes, is to share our material possessions with the brother or sister in need. If a person doesn’t care about the other, can the love of God be present in that person? To love as Jesus loved, is to be like him. If, as we hear this word, we begin to feel condemned in our hearts, God is greater than our hearts. But, keep following his commandments. Do what pleases God, and that involves two things – believe in the name of God’s Son, Jesus Christ, and love each other. If you do this, you will abide in God, and God will abide in you. Why? Because the Spirit has been given to us. There is a word of grace present here, but also a reminder that our lives are expressions of God’s presence. If there is a lack of evidence of love for others, of giving of ourselves to and for others, then the reality of our confession is called into question. The Gospel reading picks up on similar themes as the reading from 1 John 3. 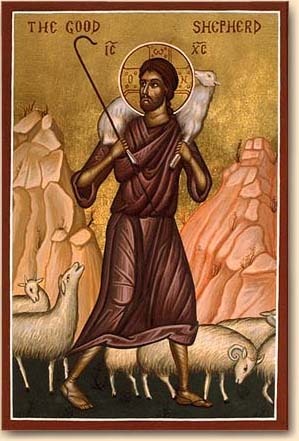 The passage begins strongly: “I am the Good Shepherd.” What is a good shepherd? Well, unlike hired-hands that flee when wolves attack, the good shepherd stands firm, laying down his life for the sheep. Hirelings (the older way of saying this), flee the field, leaving the sheep to fend for themselves. The Good Shepherd stands firm because these sheep belong to the shepherd. He knows each one of them, and they know his voice. There are no strangers here. The shepherd image was prominent in both Jewish and Gentile cultures, and it’s likely that standing behind this passage is the witness of Psalm 23. The Lord is my shepherd, the one who leads me through dark valleys, protecting me (and the rest of the flock), with rod and staff. Indeed, the shepherd lays out a table for us in the midst of our enemies. There is no need to fear, because we stand in relationship with the shepherd. It is clear from John’s text that Jesus is the Good Shepherd. Whatever it means to be a shepherd is rooted in his life, in his death, and in his resurrection. Those who follow him, taking up the shepherding task, do so in recognition of this model of the one who stands fast in the face of danger. As we consider this model, it is good to separate out what Fred Craddock and Eugene Boring call the “soft, warm and fuzzies” image of the shepherd. This isn’t a chaplaincy model of ministry. After all in the Old Testament the kings of Israel were described as being shepherds, and thus, the image “connotes both power that commands obedience and personal devotion to the sheep” (The People's New Testament Commentary, p. 321). There are a couple of items sticking out from this passage that need to be teased out. First, we need to address the question of the identity of the wolves. Even if we can’t pinpoint the identity of these attackers, it seems quite likely that John’s community is facing significant pressure from forces that could destroy the community. These wolves seek to divide, scatter, and destroy the community. Whatever the nature of the problem, and it clearly has theological components, the Good Shepherd stands firm and protects the flock. It would appear that those who follow in the footsteps of the Good Shepherd have a similar duty – to address threats to the community. It would seem that this passage would underline the importance of the role of teaching in the life of the church. Although doctrine has gotten a bad rap among progressives, is it possible for the church to become so open-minded on things that there is no longer any real substance to their faith? The other piece that stands out to me is the reference to the “other sheep.” The Good Shepherd has an intimate relationship with the flock – the community. There is in this image a sense of exclusiveness, of coziness, that is very attractive to us, especially if we’re sort of introverted. There is safety in a closed community. But John is concerned about those outside the sheep pen, the other sheep that belong to the shepherd. As to whom John’s Jesus has in mind, there are a number of possibilities. Chief among them would be the Gentiles, who by now are a major focus of the church’s ministry. It could be a concern for the unity of the church at a time when the church seems to be drifting apart, following after different leaders. Reading John 17, makes it clear that John is concerned about the unity of the community, and so is Jesus speaking of bringing two estranged communities back together? Or could it be that John has in mind later generations of Christians who may see themselves as part of the original body of Jesus disciples? I wonder if we really have to choose, for each of these has its value. Most importantly, it reminds us that even if the community has an intimate relationship with its founder, it is not a closed community. Others may enter the fold, if brought in by the Shepherd. As we ponder this passage, it would be hopeful to consider who seem to be the separated ones in our day. There are religious differences and political ones, ethnic and linguistic, cultural and generational. There is a growing trend among those under thirty to walk away from the church. Some may see this as laziness, but it appears that for many the church simply no longer speaks to the longings of their hearts or give meaning and purpose to their lives. As Tony Jones noted in a presentation I attended recently, young people want to talk about theology. They want to know whether this God we talk about has some substance, or is God simply a construct meant to keep us in line. In the community of the Good Shepherd, there is both intimacy and welcome. The Shepherd knows the sheep, but there are other sheep to be considered. As Scott Williamson writes, we must beware or conflating our “particular fold with the universal flock,” thinking that “our fold is a prototype for the flock. At stake is how far mutual love requires us to bend and change in order to be united to our other brothers and sisters outside our fold. What new languages must we learn to love them? (Preaching God's Transforming Justice , p. 221). Jesus says, as the Good Shepherd has responsibility for both flocks, which he seeks to bring in to unity (though not necessarily uniformity). We finally come to Acts 4, where we find Peter and John standing before the religious leaders of Jerusalem defending their involvement in the healing of a man who is unable to walk. They are asked: “By what power or in what name did you do this?” The way these words are placed together it’s clear that the name is power, and since “the name” is used often Acts, we know from this that whenever used, the question of power is in play. By what authority do you act? Obviously they don’t have a license from on high. Does that sound familiar? How often has ecclesiastical hierarchies quenched the Spirit? Of course, the question is both political and theological. The religious leaders – as the shepherds of the people are concerned to protect the people against heresy and against division – just as any good shepherds would do. The answer Peter and John offer demonstrates that they do not recognize this authority to determine orthodoxy, whether political or theological. They act in a different name, the name of the one the religious leaders had decided to eliminate by turning him over to the Romans to be executed. But God has vindicated Jesus, first by raising him from the dead, and now by healing this man. Peter and John say – it’s not us, it’s Jesus. Both the resurrection and the healing are signs of vindication, and serve as the foundation for his authority. Jesus is the cornerstone, the foundation of God’s new work in the world. In this new move of God, the message of salvation, of wholeness and healing, goes out in Jesus’ name, for “no other name has been given among humans through whom we must be saved.” There is again this exclusivist element to the passage, in fact, this text has been at the center of many a debate over whether or not one must confess Jesus as Lord to be saved and enter the realm of God. That is one way of reading this passage, but I’m not sure it’s the “only way.” Theologians such as Karl Barth and Karl Rahner have assumed that God in Christ reconciles the world, whether it/they make that confession or not. It is simply the way God has chosen to act. It is the only name, the final name, through which God works, but we needn’t take it in an either/or, heaven/hell manner. The point of our texts is the reminder that the Risen Christ is the Good Shepherd, who models for us the way of love, a way that leads to wholeness and healing for the world. He models this love, by standing firm in the face of the wolves and by laying down his life for his brothers and sisters who are in need. And this occurs not just when convenient, but at all times. As one who holds to a realized eschatology and who has a Bible with 1Tim 4:10 in it, I don't read these passages as exclusionary -especially, given the radically welcoming ministry of Jesus. Too, part of this discussion hinges on our understanding of what salvation is. To be saved from our sins (our selfishness and greed, etc.) and to be conformed to the image of Christ here in our daily walk, to be found going about the Masters work in the vineyard, to feed the hungry and clothe the naked -in short to walk with Jesus and become more like him is what it is all about. The corner preachers with they're "Do you KNOW where you'll be spending eternity?" spiel strikes me as such a Bizzaro-world version of Christianity which distorts the image of the Jesus I know and love and who loves me.